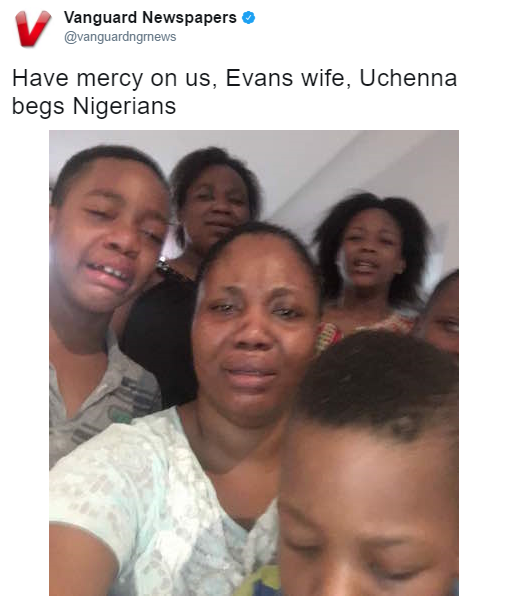 Evans wife has finally reacted to the news of his arrest and enormous wealth.. She put a call through to Vanguard’s Crime Editor, Emma Nnadozie, and she narrated all that is to know about Evans. Though she claims she never knew Evans was this rich, she suspected that he was living a secret live, but then, Evans’ usually threatens to beat her whenever she asks him to unlock his phone. She also spoke about the N20m Evans sent to her, she claims that the money was for House rent and to buy furniture..
Read Below the report, and narration.. Courtesy Vanguard Newspaper. The caller had said “hold on for Evans’ wife.” The female voice quickly pleaded to Mr. Nnadozie to call her back as she did not have enough credit. My name is Uchenna Precious Onwuamadike, the wife of the Chikwudubem Onwuamadike who you call Evans. I am 31 years old. I got married to Evans at the age of 17 at Oraifite, Anambra state in 2004. He met me while I was coming back from lesson as a student of All Saints Secondary School, Oraifite and I was in class 6 going to take my West African Examination. After we met, I agreed to go with him because of my poor background. He told me his father married three wives when he was six years old and threw his mother out of his house. He said that one of the wives influenced his father to drive them out of his house also and they were forced to stay with outsiders. Evans was taken to his grandmother who trained him. He told me his father accused the mother of being adulterous before driving her out of his house. Our marriage is blessed with five children. Our first issue is 12 years plus and her name us Udochukwu. After we got married, he said I should stay with his mother in his village at Akanmiri, Umudim, Nnewi to teach me how to be a good housewife. I was there for three years before he took me to Lagos. We were living at Satellite town in 2006 and after one year, he relocated us back to the village because he could not pay house rent. While in the village, he normally came to see us. We spent three years in the village and relocated to Ghana. On our way to Ghana, we passed through Lagos and stayed at Benny Hotels in Festac where we spent two days before travelling to Ghana. He spent a month with us in Ghana before coming back to Lagos. I was pregnant with our fourth child in 2010 when he left for Nigeria to come back in two months time. After I gave birth, he came back four months later and was able to clear the accumulated bills we kept for him because I borrowed money from friends to clear hospital bill. When he came back, he complained bitterly that things were rough for him in Nigeria and that customs seized his goods. I was not aware that he was into kidnapping and all the criminal acts he is being associated with now. All I know about his business is that he was into haulage, buying engine and spare parts for trucks and imports exhaust pipes. That was what he told me. The reason he kept me in Ghana was because he said our children should get quality education. I have spent six years here and after I stopped hearing from him, I called and complained bitterly but he said I should stay for some time. I then called his friend, Okechukwu, who now lives in China. He told me that he has not been seeing him and that he spends most of his time with a girlfriend in Festac. When I called him to complain, he was angry with me and warned that I should stop listening to gossip. He said that If I should return, I should go to his younger brother’s house in Lagos until he is ready to get accommodation for us. The brother was formally living in Lagos but he is in Brazil now. So, when it was impossible to pay my children’s school fees, I packed my bags and baggage and came back to Lagos with our children. We stayed at his brother’s house at Agric, close to Trade Fair until he took us to a house in Magodo where he claimed he owed rent pending the completion of his own house there. We have spent just one year in that house in Magodo. I have no idea of the type of business he was into but he told me that his friends overseas used to buy phones and jewelries for him. While in Lagos, i was idle and I pressured him to find something for me to do and he promised to do that. Several times, I asked him to take me to his office but he said they move from place to place to offload goods in haulage business and share profits. I can’t remember having any visitor in our house. It is only the agent called Sunny that helped us to pack into our house that I know. At times, artisans come to do one repair or the other, that’s all. I don’t know any of his friends and if we were invited to parties, he would not allow us to attend. He told me that he has no friends and that he hates associating with people. I was always indoors because he warned me to beware of Lagos women that they are wayward. I was staying indoors and it was only when I was sick that he took me to a hospital in Ikeja. I always have BP and it makes weak. We went back to Ghana on the 6th of this month and he promised to join us in no distant time. On the 9th, I called him to know when he would be coming and even the youngest of our children was crying, begging him to come as soon as possible and he promised to come. In the afternoon, I called but he was not picking. I called again, there was noise in the background and the line was switched off. I then called the driver that took us to the motor pack when we were going to Ghana and he told me that there was a problem, that police came and arrested Oga and that they came with a fair complexioned lady. When I heard all the allegations against him, I called his brother in Ghana, his mother, father and other relations but I could not get them. I then called their last born, a student at Oko Polytechnic but he said he had not spoken with him for long. I was confused until I opened Niger news and Vanguard Websites. That was how I got the shocking news about my husband. I collapsed and later called my kids to inform them what I just read about their father. Since then, I have not eaten, I am still in shock. Our children could not believe what they were reading about their father. They are saying that he cannot do all the things they said he did. In fact, while we were in Nigeria, he had never slept outside our house. My children were crying when they saw his bloody eyes and swollen face. Our condition was worsened when I saw my picture with him and our children on the face book. I don’t know where they got it. I have not been receiving money from him, I have never seen his money. The only thing I know is that there was a time he bought an expensive watch in Dubai and I wanted to know why he bought it when he could not open any business for me. He kept on teasing me, claiming it came from a friend. It was only when we wanted to travel to South Africa last year Christmas where we spent two years that he gave me N200, 000 for the trip. I have never seen him as a rich man. While with him, we made sure we had all we wanted to eat and that’s all. I can’t remember seeing any sign of affluence in him. He is not a proud man and he has been wearing one sandal and slippers for long now. He does not go for parties. In fact, I have never suspected him as a criminal. If I have been seeing any strange things, I would have suspected him. We have three cars, one Hilux, one grand Cherokee and an SUV. 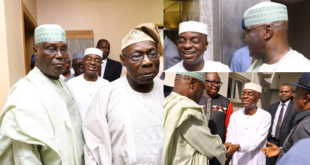 The N20m they said he sent to me through transfer was given to one Hausa man to pay into an account in Ghana to be used in paying our rent and furnish the house in Ghana. I know he banks with GTB only. Their staff used to visit us in the house. I am not aware that he has five girlfriends and I have never suspected him because he did not keep late nights. It was shocking to hear about his girlfriends. He did not answer calls in my presence. I uses to see his phones being charged but he normally switched them off. I always asked him why use pin code to lock his phones and that he lived a secret life but he threatened to beat me if ever I touched any of his phones. I didn’t even know the security pin. He would leave the house sometimes in the evenings with his phones and would come back between 8pm and 9pm. Most of the things I read about him are strange to me. As his wife, I should have seen the signs but I have not. He has cancer and does not drink alcohol nor smoke anything. I have never seen gun in our house. I don’t know where they got those frightening guns. He has never told me he has another house at Igando. Any time he went out, he always called to ask after the children and reassure me that he would be back soon. I am suspecting that whatever happened to him must have come from his father’s second wife. I don’t know what he did to him when he was young but he told the story. He said that after their mother was driven out of the house, he was with his brothers playing outside one day when the second wife called him to pick a bucket and collect water for her. He was four years then, he picked the bucket, collected water and when he came back, she removed her dress and she was wearing only a bag made from animal skin on her waist. She brought seven small stones from the bag, gave to Evans and ordered him to pour the stones into the bucket to know if the gravel would rise (sail) on top of the water or not. Evans said he did as she directed but the only thing the woman did was to take the bucket back and ordered him to go back and play with his brothers. He said he told his father later but he said he was telling lies. I feel very bad because I did not know if he was doing all these or not. Even if he was into all these, why did he not stop because of me and his children? All the time when we pray, he used to promise God that he would tell Him his story later in life. Here reads psalm 23 a lot. Even his phone, he sets alarm for 12 noon to read psalm 23. He took part in our daily prayers in the morning, evening and night. He used to lead us in prayers. We attend Anglican Church. He has never given them money to show off. We used to give N5000 or N10,000 and the highest we have given so far was N50,000 when we baptised one of our children. I am appealing to the powers that be to spare his life (crying), as I speak now, I am kneeling down with my children, crying and begging for forgiveness. Have mercy on us. He did not know what he was doing. He did not know what came over him. I am ready to come back to Nigeria and plead on his behalf. What I am reading in the news is shocking. Though, I have not heard that he killed anybody but all those he injured or took their money should please forgive him because me and my children. They should kindly forgive him, he will repent. God knows I will not be alive and see my husband doing bad thing and keep quiet. All his wealth should be sold off and given to his victims. Evans is a good man. He takes care of all his relations including the children of the second wife we are suspecting did this to him. He has just two houses in Ghana but I have never seen them. I saw the house on his phone. Since I have been living with him, he has never injured anybody or beat me. He has milk of human kindness in his heart. He has not been harsh or wicked to anybody. He always advised us to be prayerful I (starts crying again) and complains bitterly any time I failed to pray. His neighbours also know him as a kind and generous man. Members of my family are worse hit by this ugly development. They said some people brought newspaper publications to show them about their in-law and they have been wondering if he actually did all that because he has been good to all of them. I am from a very good, God-fearing family and if any of us had suspected this in him, they would have forced me out of his house for long. I am ready to come back and testify on his behalf. I will also like to see the Governor of Lagos state and explain the whole thing to him. They said he is rich but I have only N13, 000 in my Diamond bank account. He does not give me money. He told me he will be paying N40, 000 into my account every month but after two months, he stopped, claiming that he was penniless. A ring leader of a killing kidnapping squad., all the deaths will be on you. So don’t say that he never killed. She could also be picking some of the ransoms, don’t be surprised! You said you never knew your husband was a kidnapper,why saying he never killed anyone, just listen to yourself. Have mercy temper mercy with justice please Nigeria I believe he will learn alot lesson from this fault. Let the law take its cause. Its too late to ask for forgiveness. Many politicians do more than him…how many have been crucified…. No law to judge him….we are in a lawless country. Please we have to do justice to ourselves, in Nigeria if the owner of N20,000,000 is poor then tell me who will be the rich. Madam what would I tell is, kindly keep your children and give them a better life because there’s no way for your husband out and don’t continue spreeding this kind of nonsense story. Enough is enough for a wise. Arrest all politicians kill them before you kill Evans because they are worster than Evans.